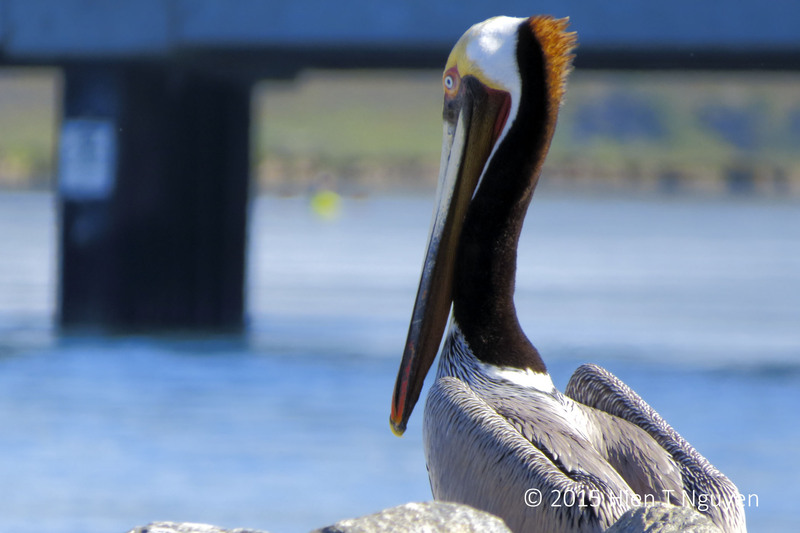 Brown Pelicans are huge and colorful birds as much as 4 ft long with a wingspan of 6 ft. They became almost extinct in the 1970’s, and their plight led to the banning of pesticides like DDT. Since then they have made a come back and are now no longer listed as endangered. I found many of them at Natural Bridges State Park and at the Moss Landing Wildlife Area between Santa Cruz and Marina. 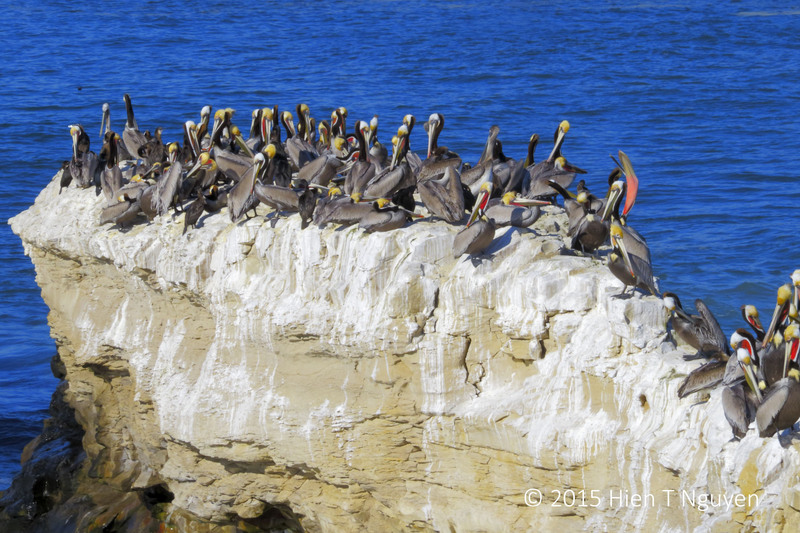 Brown Pelicans at Natural Bridge. 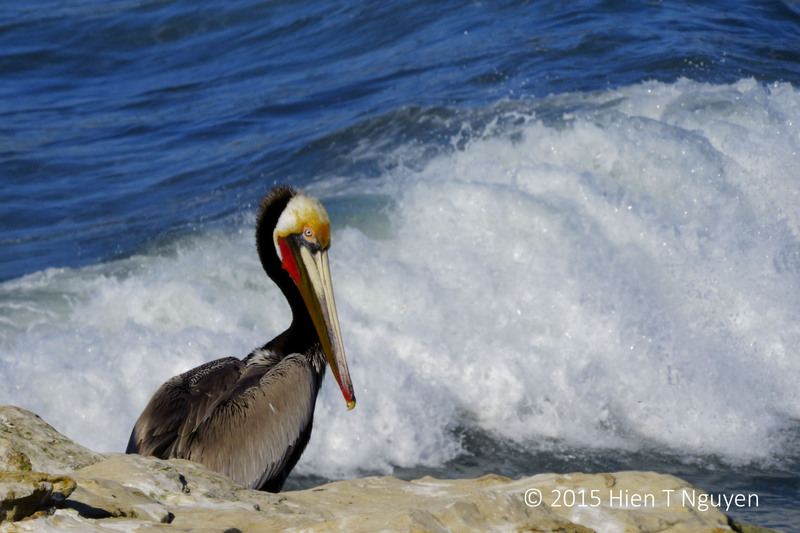 Brown Pelican at Natural Bridge. Brown Pelican at Natural Bridge. Yes, I am looking at you, photographer! Brown Pelicans at Moss Landing Wildlife Refuge. Great pictures! My favorite is the pelican posing for you! Thanks Tiny. Do you see pelicans in your area? Are they the same or different? WUNDERBAR, Hien ! – simply wonderful ! I’ve never seen pelicans in numbers like that; and I’ve certainly never seen one of these colourful versions. Love ’em ! – many thanks ! Wonderful captures Neihtn. We have similar birds here on Kiawah but don’t think they’re brown. I especially like the closeup bird looking at you! Nicely done. Thanks Tina. 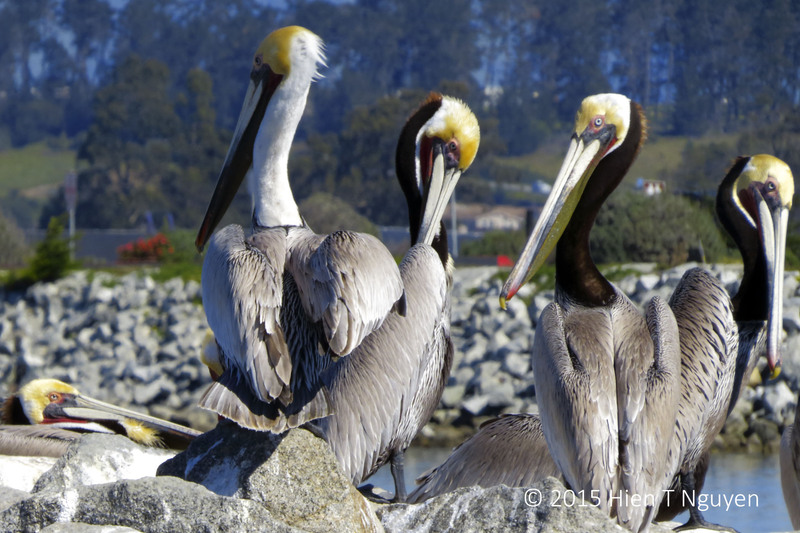 Here’s what allaboutbirds.org say about these birds: “On the Pacific Coast, Brown Pelican adults have red skin on their throats in the breeding season. On the Atlantic and Gulf Coasts, Brown Pelicans are slightly smaller and their throat skin is greenish black.” Is that what you observed? The ‘I’m Looking at you bird’ is quite funny! Thanks Sukanya! These birds can stare us down any time! Great captures of these amazing birds. We saw so many of them during our time in Manzanillo in January. 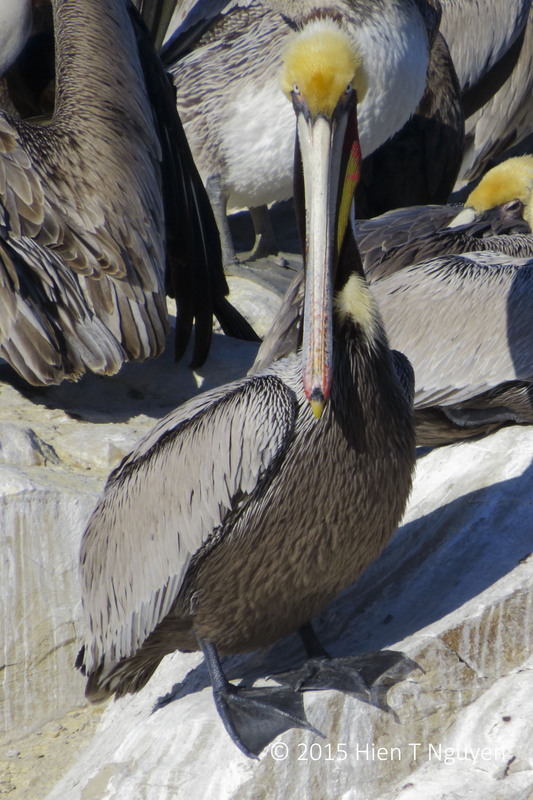 Sue, Brown Pelicans do stay year around and breed in Mexico, where you saw them. They only spend the winter in Northern California.